These White Rock Lake pelicans seem to like each other. “Love is in the air.” Swans, doves and lovebirds are popular décor themes at weddings, where the newlyweds may be described as “lovebirds.” The earliest association between St. Valentine’s Day and romantic love comes from a 14th century poem by Chaucer about birds. The poem, called the “Parliament of Fowls,” describes events that occur on St. Valentine’s Day, when birds come to an assemblage or parliament to choose their mates. Most of the birds find partners, but the leading female bird is pursued by three male suitors. The poem ends with a year’s postponement in deciding the outcome of this love quadrangle. 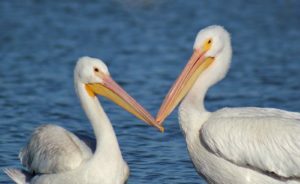 Choosing the right mate is particularly important for birds, since approximately 90 percent of all bird species are monogamous. In sharp contrast, only about three to five percent of mammals are monogamous. In biology, monogamy is defined as one male mating with one female, forming an exclusive, social pair bond that lasts at least one mating season. Monogamy refers to a pattern of social organization in which the pair live together, share the child care responsibilities and defend their young against predators. The pair bond may last an entire breeding season, several consecutive breeding seasons or for life. In the animal kingdom, monogamy probably has more to do with practical concerns like protection and efficient breeding — to promote survival of the species — than true love. Whatever the reason, it’s nice to see mom and dad raising their children together. Swans: Graceful but noisy. Swans form pair bonds that last for many years — sometimes for life. Their fidelity has more to do with survival of the species than romance. Swan couples raise many clutches of cygnets (young swans) together, learning from their successes and failures. Swan courtship rituals are often noisy affairs. North American trumpeter swans’ rowdy mating dance includes honking, synchronized swimming, head bobbing and singing. Male swans do their fair share of the child rearing. Males help incubate the eggs, allowing the female to feed more and rebuild the fat reserves she used up in laying them. Male swans ferociously guard their nests, preventing the female from mating with another male and protecting the offspring from predators. When it perceives a threat, a swan engages in a dramatic display called “busking,” it rears up with dramatically flared wings and hisses, grunts, snorts and flaps. Swan couples are more effective fighters than individual swans, so it makes sense for the pair to stick together. 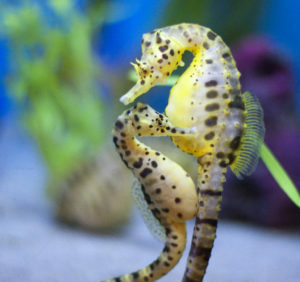 Male seahorses bear their unborn young. Gray Wolves: Team Players. Despite the expression “lone wolf,” gray wolves are social creatures who live and hunt in packs (usually five to 12 wolves). The pack centers around the pair-bond — the dominant (alpha) male and his mate (alpha female), who are usually the only pack members who breed. After the female chooses her mate, the couple usually has a life-long bond and spends a lot of time together. Gray wolves breed once a year between January and April. The gestation period is about 60 days, and most litters have seven pups. The mother stays exclusively with her pups for the first three weeks, and then all pack members help raise the pups, bringing them food and babysitting while others hunt. Gibbons: Acrobatic opera singers. These primates are the most similar monogamous animals to people. Gibbons live in families that include the adult pair and their young offspring. Gibbons families defend their territory by using loud, haunting calls that echo through the forest. Mated pairs or families sing long, complex songs together. Another National Geographic research study found that gibbons and human soprano opera singers share common vocalization anatomy and techniques. These acrobatic primates live in the trees and rarely set foot on the ground. Their bodies are perfectly designed to swing through the trees with the greatest of ease. They have strong, hook-shaped hands to grasp branches; long arms and legs with long fingers and opposable big toes (for good gripping); and shoulder joints that allow greater range of motion. Using their unique form of movement (called brachiating), gibbons can swing through the jungle at up to 35 miles per hour, bridging gaps as wide as 50 feet with a single swinging leap. Brachiating also gives gibbons the unique advantage of being able to swing out and grab fruits growing at the end of branches, out of reach of other species. Angelfish: Life partners. These reef fish form monogamous pair bonds for life. They live, travel and hunt as a pair, spending about half their time swimming beside their partner. Angelfish pairs defend their territory together. Adult angelfish are only seen alone if their mate has died. The widow doesn’t ever look for a new partner. Spawning occurs from April to September. Atlantic Puffins: Same time next year. These sea birds spend six months apart, returning to the same nesting site to mate with the same partner every year. Atlantic puffins land on North Atlantic seacoasts and islands to breed in the spring and summer, often building their nests on steep, rocky cliff tops. Females lay a single egg, and both parents take turns incubating the egg. When a chick (puffling) hatches, its parents take turns feeding it by carrying small fish back to the nest. Although their navigational mechanism is unknown, puffins may use visual reference points, smells, sounds, the Earth’s magnetic fields or even the stars to return to their home breeding ground every year.